The Southwest Michigan Regional Airport was built on a bluff overlooking the Paw Paw River Flood Plain. At the west end of the main runway, 75 feet from the end, was a 40 foot drop off. Aircraft were in danger of falling of the end if an equipment failure caused a failure to stop incident. The main runway was 5,106 feet. The need to correct this hazard was identified over 40 years ago. 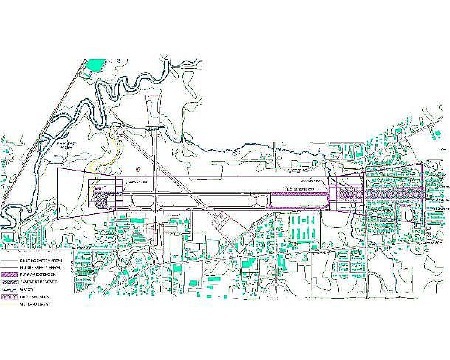 Red Arrow Highway, to the east of the runway, was relocated in 1998 so the RSA project could move forward. The RSA project was completed over an 11 ½ year work schedule. 800 feet were cut off of the Westerly end of the runway, and 1700 feet was added to the Easterly end of the runway. The new main runway now is 6,005 feet, allowing for larger aircraft to land and safer aircraft operation at the airport. One of the highlights of the project was winning the approval of the Michigan Department of Environmental Quality (MDEQ) to approve diverting Sand Creek through a 500 feet long, 9 feet high, and 20 feet wide concret culvert. This culvert recreated the stream meanders with pools and riffles for the minnows that were being affected by the relocation construction. The westerly end of the runway is now above the culvert. This culvert project has been honored with 5 awards for its design and innovation.